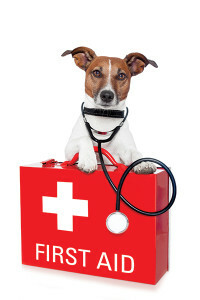 What should you put in your pet’s first aid kit? Anne and I recently attended a pet first aid class held by Lindsay Renzullo, DVM, Assistant Medical Director at Bulger Veterinary Hospital in North Andover, MA. Your veterinarian’s emergency numbers and the numbers of veterinary emergency hospitals in your area. Call your veterinarian or go to an emergency hospital immediately if you see your pet eating something toxic. Induce vomiting with hydrogen peroxide only if your pet eats something toxic – mushrooms, antifreeze, rodenticide, alcohol, chocolate, etc. A sock. The sock can be used as a muzzle, or to wrap around a wound, it can also be used to apply pressure to a bleeding wound. A muzzle – injured pets bit. They are not trying to hurt you, they just don’t want you to hurt them. Extra leashes (in case you find a stray who needs help). Diluted betadyne solution, or diluted iodine solution (dilute 1 part betadyne to 5 parts water). Benadryl 1mg/1lb (the PINK box. Ingredients in Allergy Benadryl can be toxic to pets) this can be administered for bee stings, or other allergic reactions. Call your vet or an emergency veterinary hospital before administering. I think this is a great basic list and I would like to add a few items I’ve found a need for. Thermometer – normal temperature of dogs and cats is 100.5 to 102.5. Take your pets temperature under normal conditions so that you’ll get a baseline. A first aid guide book. Note that this is a basic list. Your kit could include many other items but this is a good start. My honest reaction to most injuries or medical concerns is to bring my pet to the vet. Quick reliable veterinary care can actually save you money in the long run. Previous PostPet CPR VideoNext PostNeed some help taking care of your pets… How to get the kids to care for their animals.